Daniel Schultz is a graduate student at Montana State University in the Community Health program. He considers himself to be a public health nutritionist while working towards his dietetic certification, who aspires to change the social, economic, agricultural, and political environment to promote wellness. He has completed six half marathons, one full marathon and a century bicycle ride. His experience of overcoming obesity as a teenager is the catalyst for his work in public health and his belief in lifestyle interventions. More people eat rice than any other grain, and rice is the second most produced grain behind corn. The common variety of white rice is processed to remove the bran and germ, which also removes fiber and B vitamins. The rice is then polished to improve appearance. For better nutrition, choose brown, red, black or wild rice. Brown rice is only processed to remove the husk, but still has the intact bran and germ. 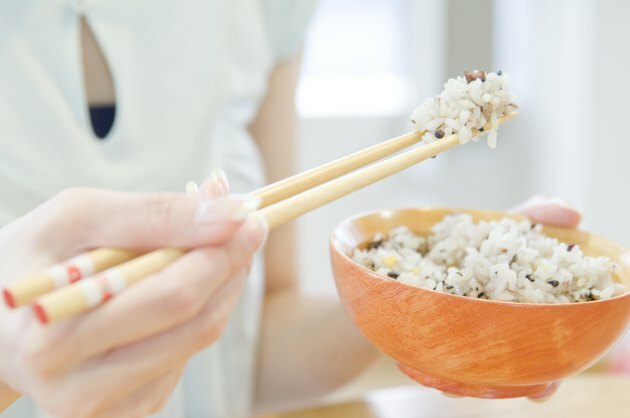 Brown rice provides nutrients like vitamin E. This vitamin plays an important role as an antioxidant and can help protect your body from free radicals, which are molecules that can damage cells. In addition, brown rice has 1.5 more grams of fiber than white rice per half cup cooked serving. Just like brown rice, the bran and germ are still intact with black rice. A unique quality of black rice is its high amount of antioxidants which can protect your body against inflammation. A study published in the “Journal of Agricultural and Food Chemistry” in 2010 found that the antioxidant activity of black rice is about six times that of white rice. Native Americans have consumed wild rice for hundreds of years. Wild rice is know for its nutty flavor and high protein content. A half cup serving of wild rice provides more than 3 grams of protein and 1.5 grams of fiber. Additionally, wild rice contains important minerals like potassium, which helps support healthy blood pressure. You can find red rice labeled under the names cargo rice, Ruby red rice or Bhutanese red rice. Similar to black rice, the color comes from beneficial red anthocyanins. Red rice provides 4 grams of protein and 2 grams of fiber per each ¼-cup serving of dry rice.